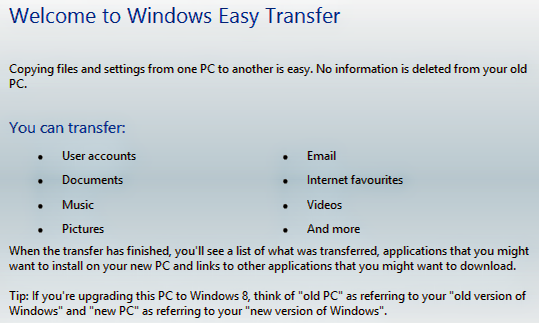 Windows Easy Transfer allows you to transfer files from old PC to new PC. Suppose you're upgrading from Windows 7 to 8, you can easily back up your files and restore them to the new system. Or if you have any plan to change your system unit, you can easily back up your files through Easy Transfer. Later you can restore your files to new PC without affecting your prior settings! Current generation is too fast. Changes occur within seconds. Computer world is much faster. Hardware technology is being changed to meet the demand of software manufacturer. Consequently, consumers need to upgrade their system frequently. While upgrading your system, you must face difficulties to back up your files. Considering this issue, Windows has an easy way to back up your files - Windows Easy Transfer. Documents & more . . .
You can also customize what to back up and what not. There are mainly two thing you can do. First, you can back up your necessary files and settings. And second, you can restore them in a new PC. You can also back up your files for the purpose of future use. Later it can be used if your system crashes unfortunately. Press Start & Type - Windows Easy Transfer, Open it. Welcome Screen will appear > Press Next. Type password to protect the files or leave it blank if not necessary > Press Save. Remember, the above steps are applicable for External Hard Disk/ USB Flash Drive only. If you wanna back up using network or cable, then you need to connect both PC either by network or by easy transfer cable. Note: If you transfer the files using network or transfer cable, the process will be completed immediately. But it is recommended that you use flash drive or hard drive if you like to keep them for the future use too. The restoration process is somewhat similar. Open Windows Easy Transfer as before > Press Next. Choose External Hard Drive as media. Locate and open the previously saved file. Hit on the customize button if necessary. Finally hit on the transfer button to restore your files, settings and documents. That's it!